Vivekananda Kendra Raipur organised yoga satra at Deendayal Uppadhyay Nagar's Greenland garden from 25/10/2015 to 03/11/2015.Total 15 participant took part in the yoga session. 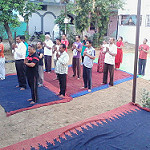 Loosening Exercises, Basic Assans, Pranayama, Suryanamaskar and Kriyas were taught. In concluding session of yoga satra, Shri Subhash Chandrakar (Kendra's Varishth Karyakarta) said that yoga is not only physical exercises, it connected individual to society. He also gave introduction of activities of Vivekananda Kendra and appeal to all participant to contribute in national work.